Last month we launched Open Data Scotland - a pilot site built for the Scottish Government to showcase how Linked Open Data can make for smarter, more efficient data use. 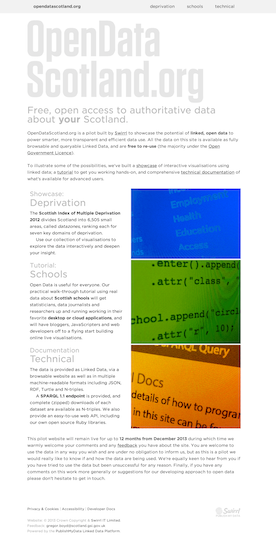 Accompanying the site is a report (download pdf) which we produced to explain what open linked data is; how to publish it effectively and its potential use and benefits to the Scottish public sector. We wanted to emphasise the potential of Linked Data to a range of users. So, we’re using datasets with topics that have proven popular in other projects, such as deprivation data and we’ve targeted each section of the site to a slightly different audience. One new concept that we introduced in this project are contextual tutorials, aimed at a range of users: from those working with spreadsheets to those interested in more technical Linked Data wizardry. We love it because it gives a whole new set of people a friendly way in to using the data. We’re introducing a whole new audience to the power of Linked Data. Something else new to this project are data kits. These kits bridge the gap between the interactive visualisations and the more technical aspects. They also help more advanced users get started on working with the data in the site. This helps to get the right information to the people who want it, in a form that allows them to use it quickly and easily. We’re really excited about this project which emphasises how interactive, accessible and useful Linked Data can be. Bill introduced the pilot at the Open Data Scotland conference in December. Check it out yourself and let us know what you think.